in office but it is trite to say that the first few days of Mr Udom Emmanuel in office as the fourth democratically-elected Governor of Akwa Ibom State has been very eventful. After 48 days in the doldrums since April 11, the Finance Expert and Fine Administrator was sworn in as Governor of Nigeria's foremost oil rich state on May 29, 2015 at a well attended and colourful ceremony at the Godswill Akpabio International Stadium otherwise christened, "the nest of champions". Distinguishing Governor Udom Emmanuel's first week in office are a great spiritual awakening via fasting and prayers and a complete re-dedication of the land to God, a string of fundamental political appointments, an unprecedented display of time consciousness and punctuality, a rehearse of campaign promises and blueprints amongst several others. Governor Udom's unshakeable faith in God in a 21st century society drifting to liberalism is inspiring. He has reiterated in his first few days his belief that God will hearken to the prayers of the people of Akwa Ibom State and will pour his blessings on the land following their humility and prayers to him. On Day 2 of the fasting programme, he made references to the book of Job 2015 where he lamented that the land had swallowed all the flourishing companies in the state, and urged the people to continue in the prayers for the total restoration of the Lord's blessings in the state. Mr Emmanuel has strongly commended the people for joining him in the spiritual exercise, and positioned that their sacrifices will be reaped by generations yet unborn. In a nation like ours where denial of campaign promises is steadily becoming a norm, Mr Emmanuel toed the path of honour and dignity by reiterating the fine promises he made on the day he declared his intention to run for the governorship seat. He enumerated his core concerns, unedited, which are: To leverage and build on the Uncommon Transformation of the Governor Godswill Obot Akpabio administration. To transform the economy of our State via industrialization and sustain public-private sector initiative, thereby opening up opportunities for growth and improved living standards. To respect and uphold the tenets of democratic governance which our great party (PDP) unflinchingly stands for, as well as respect the party's structure, decisions and hierarchy. To ensure the security of lives and property of the people at all times, while adhering to the principal of the rule of law, thereby ensuring equity, justice and fair play. To promote unity and oneness across the State, with due respect for Traditional Institutions and the Elders of our Society. To continuously develop mobilize, and empower our women and the youths via planned and well articulated welfare and capacity-building programmes. To give all Akwa Ibom persons (both within Nigeria and the Diaspora) a proud sense of belonging-built on good governance, economic advancement and due respect for the Fundamental Human Rights of all. To pursue the taks of Rural Development and Integration with all vigour, bring the benefits and dividends of our democratic governance to every nook and cranny in the state, and provide basic amenities of life to all. To ensure Accountability and Transparency in government by fighting and tackling corruption in all facets of our Administration. To provide trade, commerce and tourism between Akwa Ibom and the rest of Nigeria, and in fact, the rest of the world. To foster, develop, and maintain a good working relationship with both the legislative and the Judiciary arms of Government in the state, as well as ensuring an effective Local Government Administration for grassroots development, mobilization and empowerment and To attract all possibly required Federal presence to Akwa Ibom State, by developing and sustaining a harmonious and very cordial relationship with the government at the centre. Another distinctive feature of the early days of the Udom Emmanuel administration are the key appointments of Elder Etekamba Umoren as Secretary to the State Government, Mr Ekerette Udo as Chief Press Secretary, Pastor Bassey Umoh as Permanent Secretary, Governor’s Office, Mr Edmund Uffang as Protocol Chief and Pastor Daniel Akwatang as the Special Assistant to the Executive Governor on Religious Affairs. The appointments have been widely applauded, although I am not blinded to the reality that a few questions have been asked concerning the appointment of Elder Etekamba Umoren as SSG. It must be stated and swiftly too that the template for allocation of political offices in the state is the zoning arrangement of the Peoples Democratic Party (PDP) in Akwa Ibom State. The party at an enlarged caucus meeting in December 2014 allotted these positions along senatorial district lines. For Eket Senatorial District, the party accepted that the district should produce the Governor, Deputy Speaker, Deputy Chief Whip and State Secretary of the Party. Ikot Ekpene Senatorial District was to produce the deputy Governor, Majority Leader and Chief Whip of the State Assembly, as well as the deputy chairman of the State Chapter of the Party. Uyo senatorial District was favoured to produce the Federal Minister, State Party Chairman, Speaker and Deputy Leader of the State House of Assembly. At no point was the office of Secretary to State Government mentioned, implying that the appointment lied within the powers of the Governor to determine. However, while it is impossible to stop people from asking questions and inquiring which village Elder Etekamba Umoren comes from, what cannot be taken away is Sir Umoren's track record, protestant work ethic, commitment to duty, experience in the civil and public service, professional badges and his legacy of loyalty to constituted authority. Right from his days at the Abuja liason office, to when he became the Director of Protocol to then Deputy Governor, Chris Ekpenyong and subsequently a Director in the Ministry, and Permanent Secretary, where he served and retired, the University of Benin old boy has left no one in doubt about his competence and dedication to duty. What more could one need at a period of transition from one government to another than experience and maturity which is not sold in the market. 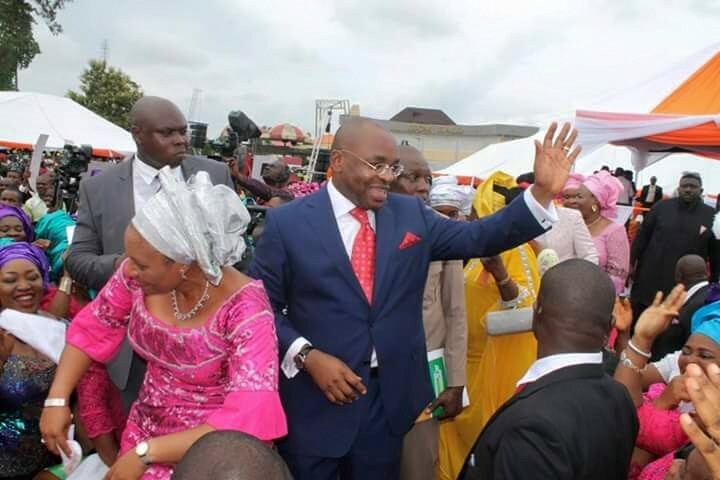 Governor Udom Emmanuel reminds me of Michelangelo, who said that “Every block of stone has a statue inside it and it is the task of the sculptor to discover it.” I am convinced beyond doubt that his administration will implement strong, vibrant and innovative policies which will enhance societal development, economic growth, empower the working class, bridge the gap between the rich and the poor, alleviate poverty, reduce unemployment, improve health and education, develop small businesses, cater for children and the aged, build strong families and provide a secure Akwa Ibom State.